I've been enjoying reading the new series from Image Comics called THE REALM. 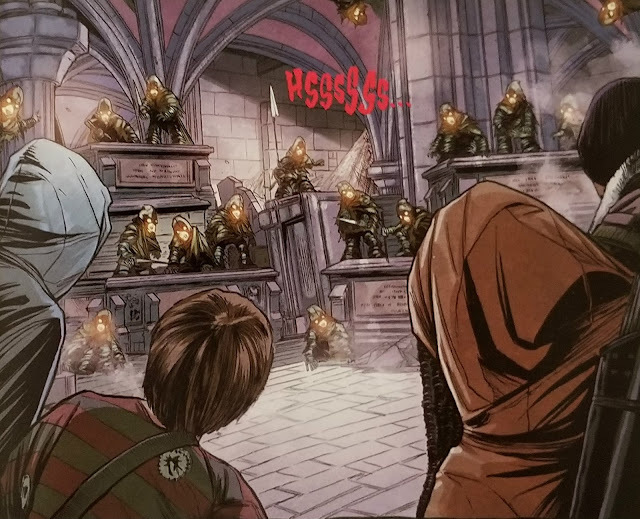 It is a comic book apocalyptic adventure that has a Dungeon & Dragons meets The Walking Dead vibe to it. The story is set fifteen years after a cataclysmic event impacted the Earth which involved an energy burst that destroyed the ability for anything using electricity to operate causing technology and vehicles to be inoperable. This was followed by mystical portals opening up around the world unleashing hordes of invading mythical creatures like goblins, trolls and even dragons from another dimension. The story combines realistic elements from everyday life and spins them together with a fantasy landscape filled with monsters and magic creating a captivating supernatural drama. In THE REALM, a group of humanity's survivors embarks on a quest to reclaim our planet from the growing darkness that is enveloping it unleashed from mysterious portals that arrived the day electricity stopped working. Can they find a way to reverse the dampening field that is hindering people from using the technology and transportation that society had become dependent on? Can our heroes shut down the portals transporting these alien invaders to the Earth? Or is the planet destined to end up looking like the setting for J. R. R. Tolkien's novel Lord of the Rings. THE REALM is released in monthly installments and I've looked forward to getting my hands on each new comic book issue as it comes out. The creative team has taken what could have been a really cheesy concept and portrays this nightmare scenario as if it crazily actually happened. It provides a gritty drama that is interesting to read complimented with excellent artwork that draws you into the story. This series provides an entertaining escape from reality for its readers which in my opinion is what comic book authors and artists should always be striving to achieve. This comic book series is rated M for Mature Audiences. 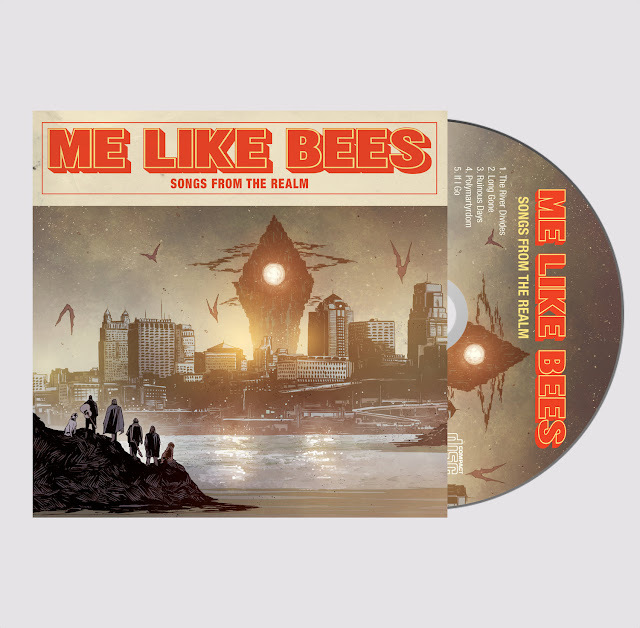 To further immerse readers into THE REALM experience, its creators have teamed up with the Indie rock band Me Like Bees to create a musical soundtrack for the comic book series. Me Like Bees has created a five track album titled "Songs from the Realm" as well as a music video for the first song, The River Divides to give readers a multi-media experience when it comes to reading these comic books. Movies and television shows have music soundtracks so why not comic books too?! You can also purchase a compact disc of "Songs from the Realm" from Me Like Bees website or buy digital downloads of the songs from iTunes. Great comic books … great tunes … I encourage you to pick up THE REALM from your local comic book shop, tune in to the soundtrack from Me Like Bees and imagine yourself in a world where scary creatures have come to life. How would you cope in a world without automobiles, lights, the internet, refrigeration, and other conveniences we've become accustomed to that has suddenly become filled with monsters straight from the pages of a Dungeon and Dragons fantasy game? 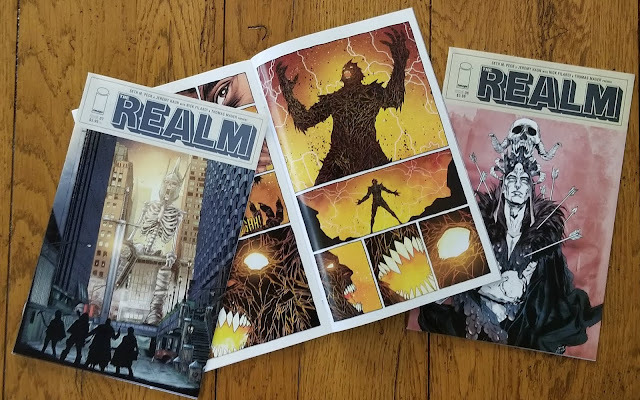 Reading THE REALM will immerse you in that world and have you anxiously looking forward to each new issue.